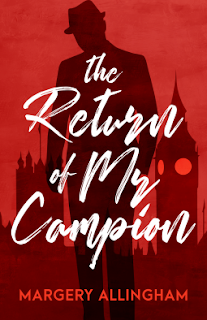 The Return of Mr. Campion is a series of short stories with the Margery Allingham style. She was one of the best writers of her day and many Author's have listed her as a favorite. Not all of the stories contain Albert Campion and in fact they are a mixed bag but I enjoyed each and every one. The insight into her writing life is especially interesting and with short stories you can go at your own pace. I recommend this and really enjoyed reading it. Readers of the Golden Era of writing should take note of these. In this fantastic collection of thirteen short stories, Margery Allingham explores both the Mystery and the other genres it has allowed her to write. From a portrait of her leading man to classic capers, and from traditional British mysteries to wonderful literary short stories, Allingham displays her wit, her humour, and her prowess not just as a Mystery writer but as a storyteller. 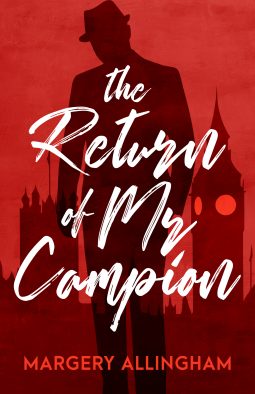 Published thirty years after it’s first publication, The Return of Mr Campion proves that both The Mystery and Allingham, are still everywhere. Georgette Heyer, has added another witty, solid mystery to her Collection. Although, this Book was written in the Golden Era of Mystery the characters are still fun for today. Nigel has languid charm, Sally writes mysteries but wears a monocle, Helen, her sister is one of the suspects. There are all the usual interactions and red herrings to make this a new favorite of mine. 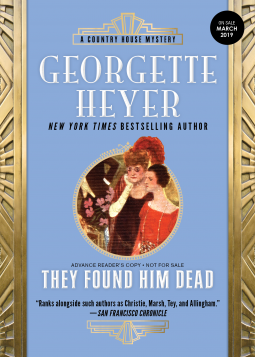 Heyer, famous for her Regencies turned out just as good a mystery. PC Glass whose every word is a quote from the bible made me laugh several times. The cast is strong in this one. An old -favorite, Superintendent Hannasyde, is on the trail through lies, bad alibis and murky comings and goings. Somehow it all makes for delicious reading. 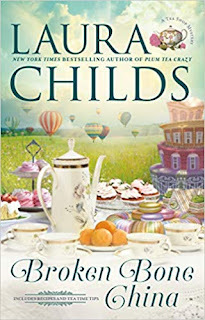 This is the twentieth Laura Child Tea mystery and it starts off with a bang- literally...Theodore Browning and Drayton, her tea connoisseur, are up in a hot air balloon and witness the attack and explosion of another hot air balloon near them.When one of the victims has a Navy Jack flag, from the Revolutionary War Days disappear- then millions are at stake and a determined killer is on the loose. Theodosia and Drayton, witnessed the attack together- but she is the one hot in pursuit building up clues. Drayton, is a reluctant partner in all this, but it makes for a warm friendship between the two of them. 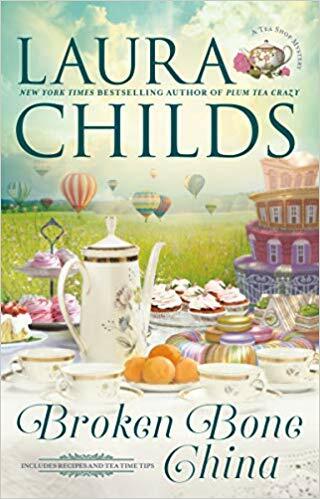 Laura Childs, provides a charming, cozy, atmosphere with this one and between clues we are fed with Hayley's wonderful food and Drayton's choices of Tea. I love the thought of all those colorful, rich, teas served in Spode teacups. The names Chinese Gunpowder Green, Chai Masala or Tippi Yunnan China black Tea, sound exotic and elegant. Customers are left to gaze out the window of the Tea Shop, located in the historic district, with all its atmosphere. Charleston is very charming and the location makes the series even better. Broken Bone China, provides us with a wonderful array of characters-any of whom could be wearing a false face. If you read cozy mysteries for the clues, food and the details- then you will love this one. Five stars for a bang-up story. Sirens scream, first responders arrive, and Theodosia is interviewed by the police. During the interview she learns that one of the downed occupants was Don Kingsley, the CEO of a local software company, SyncSoft. Not only do the police suspect Kingsley as the primary target, they learn that he possessed a rare Revolutionary War Union Jack flag that several people were rabidly bidding on. Georgette Heyer, famous for her Regencies, should not have her crime series overlooked. The mysteries are charming, with fully developed characters and a Country House background. They are tightly woven and entertaining and I had more than one chuckle out of a character named,"Terrible Timothy." This is a time frame when the language was full of words like "corkers." I have always liked the Golden Era of writing mysteries for their colorful language and descriptions of evenings spent with cocktails and playing games after everyone dressed for dinner. The sophisticated atmosphere included mists and walks after dinner... filled with ways to bump off a character. The English Manor house style is just a narrative I really like. When you read these books you are getting a bit of history too on the side. I had a good laugh at the fast cars of 40 miles per hour. Silas Kane is celebrating his sixtieth birthday among family and business partners. The celebration is rife with atmosphere between Rosemary Kane and her Husband, Clement, as well as the Mansell's... Partners to the Kanes and very much interested in a business proposition, which Kane would need to put up twenty thousand pounds in - if he agreed. A business proposal that he meant to turn down ...when he is found dead one morning. Silas Kane's sixtieth birthday party is marred by argument and dissension amongst his family, and then the next morning, Kane is found dead. The coroner's verdict of death by misadventure would seem to confirm that Silas accidentally lost his way in the fog. But then his heir is shot, and threats are made against the next in line to inherit his fortune.The redoubtable Superintendent Hannasyde is called in to investigate. All clues point to an apparently innocuous eighty-year-old woman, but as the Inspector delves further into the case, he discovers that nothing is quite as it seems? 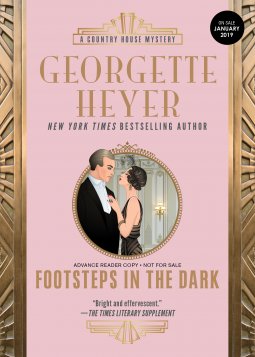 Georgette Heyer, famous for her Regencies, wrote quite a few mysteries that have stood the test of time. The Characters are quite charming-very posh and have hidden secrets. The time-frame warrants both "bounders" and debutantes with hard as nails Mama's not to mention our likeable Kane's who featured in a previous book. What more could you ask of a teaser of a mystery? Mr. Timothy Kane has taken a decided interest in Miss Beulah Birtley, secretary to Mrs. Haddington. She is dark, and has some sort of mystery as well as a large chip on her shoulder. Mr. Kane's Mama has sent his big Brother down to check everything out- only to wander into a murder. The mystery has a lot of interesting characters...very English and clues are thrown out with increasing regularity as Inspector Hemingway has to dig into each story. His faithful sidekick, Inspector Grant, has an endearing way of sprinkling his sentences with Gaelic. But will this be the only murder Hemingway has to deal with? I fund this Mystery quite wonderful in its period expressions and details to clothes, drawing-rooms and even a nod to the wild and frivolous lifestyle of the rich. Published in 1951 it has all the background of the 1930's which is when many of the other mysteries were published. If you like this Golden Age Period or Heyer's writing you will certainly want to read this. I gave it five stars. Charles and Celia, along with Peter, and Margaret, brother and sister to Celia, have inherited an old house in a small village in England. An eccentric Aunt had left it to them complete with no electricity and a ghost known as the Monk. It has an old Priory and a neighbor, Mr. Titmarch, who floats around in the dark of night chasing moths and crosses regularly onto their land. The other Neighbors are the Colonel, and the Vicar and his wife. If the place only had rats Celia and Margaret could probably manage but they draw the line at the Monk. Georgette Heyer writes a very well-executed Mystery with this one. 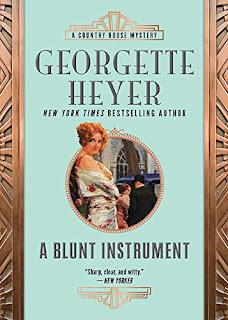 Her characters are droll, sophisticated and amusing.The book is a light-hearted mystery but at the same time there is a sinister undercurrent. Things keep happening that are odd. Heyer, has a natural genius for farcical remarks and post-war humor in which the men are both bored, sanguine and witty while they perform quite heroic things they make light of...this was a very good book to start at night but the problem was how to stop. I like the way the Golden Era produced mysteries.The plot and people are entertaining enough that I kept reading till the early hours and still kept on. Locals claim it is haunted and refuse to put a single toe past the front door, but to siblings Peter, Celia, and Margaret, the Priory is nothing more than a rundown estate inherited from their late uncle-and the perfect setting for a much-needed holiday. But when a murder victim is discovered in the drafty Priory halls, the once unconcerned trio begins to fear that the ghostly rumors are true and they are not alone after all! With a killer on the loose, will they find themselves the next victims of a supernatural predator, or will they uncover a far more corporeal culprit? Ivy Meadows goes undercover at a Renaissance Fair as a sashaying, mute, belly dancer ...with a sign hanging on her bum. She plunges into her sleuthing to find out who had killed a Jouster. The Knight's horse that had been stolen- ended up at a famous Broadway Producer's Ranch. Strictly in the name of following a lead she puts herself up for an acting job as Marilyn Monroe. The characters at Renaissance include a bird training act, a fellow jouster who has been arrested and a Wizard who partakes of magic dust a little too often. Cindy Brown writes from a strong background in the Theater. Her cast of characters are finely drawn and ring true to form. 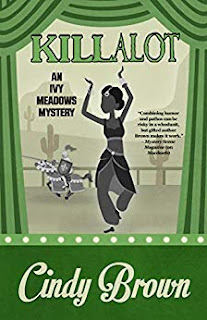 The hilarious Ivy, who is always late, drinks too much coffee and has a boyfriend she worries about- adds a great touch to these cozy mysteries. The action keeps the book a fast read because you never know what Ivy/Olive will get into next. The character is someone you would love to have as a friend though. The Renaissance Fair plot provides a lot of magic, color and fabulous people. If you enjoy funny, fast- paced mysteries this is the one for you. I do and so I am giving it 5 stars. A jouster, a playwright, and a detective walk into a faire…but it’s no joke when one ends up dead. Actress and part-time PI Ivy Meadows is thrilled when she learns that the famous playwright behind Hello Dolly Madison is in Arizona. Not so much when she realizes he’s a suspect in the murder of a Renaissance faire jouster. As is her friend Riley. And about a thousand other people, all disguised in Renaissance costume during the fatal jousting match. 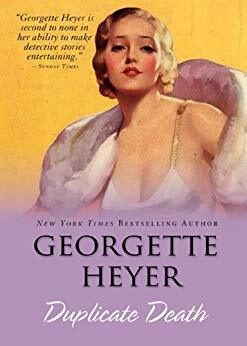 When Ivy is hired to investigate the killing, she goes undercover as a Cockney belly dancer at the faire and finagles her way into the playwright’s Kennedy-inspired version of Camelot—as Marilyn Monroe, no less. Then, in the midst of her toughest case ever, Ivy has to solve another dilemma: Will she follow her lifelong dream of being an actor or settle down with the love of her life? The murder investigation, the play, and real life come together in a twist that begs the question: Is there a happily-ever-after for anyone?